Whether you're breastfeeding or bottle-feeding, your baby can -- and should -- start to drink cow's milk sometime after her first birthday. Most parents start their babies with whole milk, because of young children's extra need for fat in their diets. Later, however, it's time for toddlers to transition to 2 percent milk. Most toddlers are ready to make the switch to 2 percent milk around the time of their second birthday. Before that, toddlers should drink whole milk exclusively. Whether it's whole milk or 2 percent, children younger than age 5 should limit their milk intake to 2 or 3 glasses -- between 16 and 24 oz. -- per day, recommends the University of Michigan Health System. During the first two years of your toddler's life, he needs plenty of fat; in fact, healthy fats should make up about half of your child's daily calorie intake during that time, according to BabyCenter. 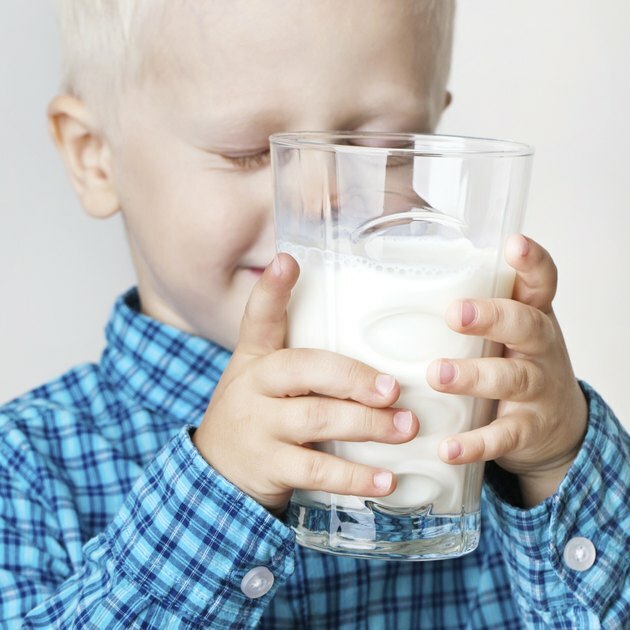 Since toddlers are often picky eaters, drinking whole milk can help ensure that your child gets the calories he needs during the day, says pediatrician and parenting expert Dr. William Sears in "Parenting" magazine. Both whole and 2 percent milk are also good sources of essential nutrients, including calcium, vitamin A and phosphorus. Most milk is also fortified with vitamin D.
After your baby's second birthday, switch to 2 percent milk. Around this time, your child's growth starts to slow down and, with it, his need for lots of extra calories and fat. Two percent milk has the same nutrients as whole milk and actually contains more protein per serving, according to Sears, but it provides significantly less saturated fat. Once your toddler has passed his second birthday, the risks of saturated fat -- including clogged arteries and obesity -- are greater than the early benefits.